Just wanting to let my readers know that in the near future I will be making some changes. I am currently in the process of building an official website that will better showcase my art and, hopefully, will also allow me to continue my blog posts all in the same location. Those of you that follow this blog may get lost in the process (I hope not, but apologize if you do). I will be switching this domain (currently www.catherinetemple.com) to the new website and this blog will go back to www.catherinetempleart.com. I am hoping to have the new website up and running by the end of the month. It's been bouncing around in my brain for some time and I finally decided to just do it. The process has been time consuming and humbling with several false starts, but I think I've finally settled on a hosting platform that will work. So, the next time that you type in that domain it should take you to the new site. Thank you for following this blog and hopefully I will see you at the new one soon! Happy Spring! Well, another month has slipped by and I haven't posted much. It's not that there hasn't been anything to post, I just haven't taken the time. Shame on me. In my defense I have been very focused on my art these last several weeks. 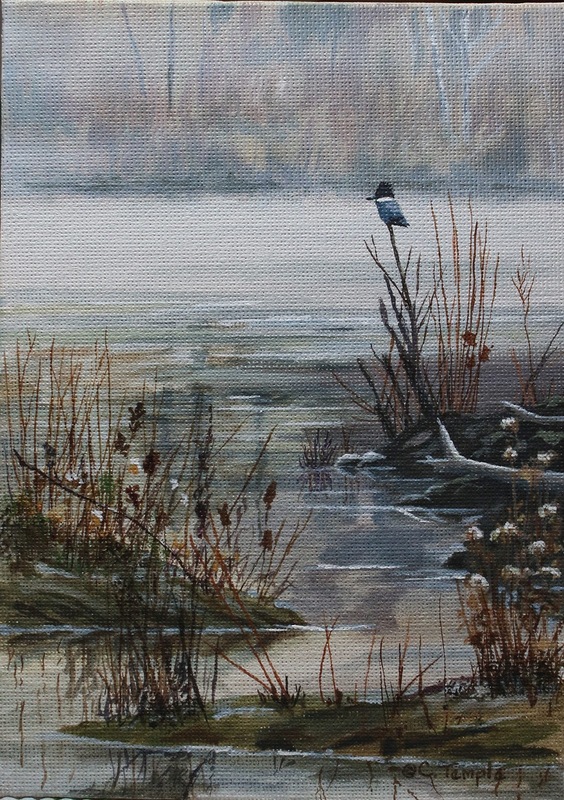 Most of the month of January I spent painting ten small works for the Valley Art Center show for the month of February. This was a fund-raising event for the gallery and it was a wonderful success for both the gallery and the artists. Over thirty artists were represented each contributing between five and ten small pieces of art. We had over two hundred pieces to choose from. When the show opened folks in attendance literally ran for the walls to grab their favorites as this was truly a "grab and go" show. Sixteen paintings sold in the first ten minutes! It was crazy fun! I used this event as a chance to try out some different subject matter and airbrushed backgrounds. I painted two butterflies using the airbrush and thought they turned out rather nice. The soft focused background really made the butterflies pop. I was excited when they were both chosen to go home with a new collector. This red fox was very popular and I probably could have sold more just like him had I painted more than one. I had also rented wall space in another part of the gallery to showcase some of my larger pieces that I had left from my October show. I was ecstatic when someone walked through the gallery carrying one of my favorite paintings, Dawn Patrol, and took it home for their own. By the time the opening reception ended nine of my ten paintings had sold and dozens of other artists works went as well. As I said, it was crazy fun! 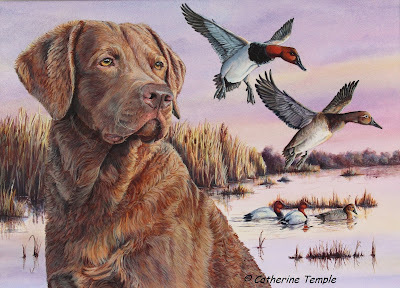 Once that show was past I then turned my focus to creating my next duck stamp entry. I decided to enter Delaware's contest again this year as they are still featuring a dog and a duck on their stamp. This year it will feature a black Labrador retriever and long-tailed ducks. This species of duck was a little more challenging for me as I have only had the opportunity to see one only once in my life. I took photos at that time, but the birds were rather far away. 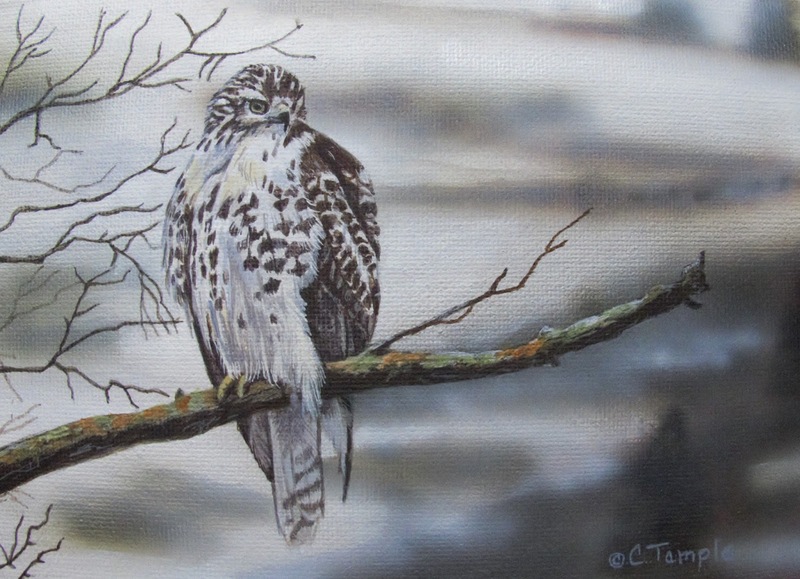 I spent several hours studying others photos of these birds and even spent time watching hunting videos to get a better idea of the habitat they're found in and how they interact in it. Eventually, I put together a sketch and started painting. Unfortunately, I can't show you anything until after the judging in April, but you can be sure I will post the results and my entry either way. So, what's up next? Well, if I wanted there are enough duck stamp contests to enter one every few months and I do have plans to enter more. However, I think the next painting may be for me personally. I still haven't painted my dog, Balin's official portrait. The Delaware duck stamp doesn't count as that. My idea for his official portrait will be more of a montage including his puppy stage, adult stage and maybe an aspect or two of his true personality. I can't wait to get started on that! 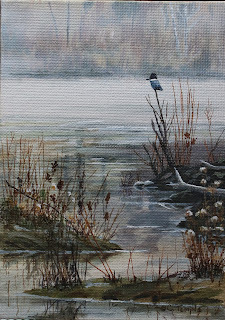 Quiet Time - Kingfisher - Acrylic 5" x 7"
Happy New Year everyone and Welcome 2018! It's hard for me to believe that a whole year has come and gone already! This past year was a wonderful adventure filled with exciting opportunities, new friends, great successes and some challenges. I pushed myself harder than I have in years to reach my goals and was rewarded for my efforts. I feel pretty good about that. Now we're looking at a new year ahead and I'm working at formulating a new plan. At this point the plan is a little vague since I don't have a show or other major event that I'm working towards, but that can always change. The year is still young. "First Winter" juvenile Red-tailed hawk - acrylic 5" x 7"
To start off 2018 I am working on ten small paintings that are going to a fundraiser for Valley Art Center in February. These mini-paintings, only 5" x 7", are giving me a good opportunity to experiment a little. I got a new airbrush for Christmas and I'm practicing, on a small scale, with soft focused backgrounds. As I have been working more in acrylics lately achieving this look with a brush is challenging as the paint dries quickly making it hard to blend. An airbrush can help to create that softer background and give the painting a sense of depth. Learning to airbrush isn't without its challenges though and you can easily overdo the look, but it's fun to try some new things. The show is called "A Heart for Art" and will feature the works of several talented artists. Each painting will be for sale for the small price of $40.00. The opening reception will be Friday, February 2nd from 4 - 7 p.m. and will run through the end of February, however that first night will give you the best selection and it's usually pretty fast paced with paintings nearly flying off the walls.The show is designed for patrons to be able to take their purchases home that evening and a framer will even be on hand with pre-made frames. It's sure to be a fun event so please plan to come if you can. Well, 2018 is off to a flying start! Guess I'd better get back to work as February will be here before I know it. Here's hoping 2018 is a good year for everyone!